One day he’s on top of the world. 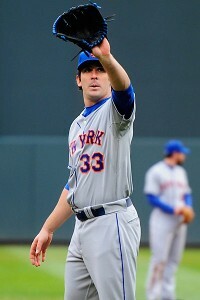 One of the best in the league and a true Cy Young Award contender. Nothing seems to phase him. He’s an All Star starter and he’s got the Big Apple on its ear. The next day he’s staring at a surgeon’s scalpel and possibly will be out of the game until 2015. Such is the risky life of a starting pitcher where the torque of a twisting arm throwing a breaking ball in an unnatural and unorthodox nature can cause you to be out of the game, perhaps permanently. Matt Harvey was the talk of baseball a few weeks ago. Now he’s the talk of the game, but for all the wrong reasons. In another few weeks he’ll be remembered as the guy that will probably disappear from the baseball scene for a year and a half. Partial elbow ligament tears are a difficult thing. St. Louis’ Adam Wainwright had one and continued pitching effectively for five years, winning 20 games in 2010 before his elbow ligament finally gave way. Chad Billingsley was unable to make it to his third start of the season after being shut down in August the previous year. For most the consensus is that the ligament replacement surgery will eventually have to be done, so it’s best to get it over with. Try convincing a pitcher like Harvey who could do almost no wrong on the mound that surgery is the best option has got to be difficult. It’s got to be a real crushing blow and difficult for him to accept. It was for Billingsley. Through decades of baseball pitching and study of the craft, very few understand anatomy to the extent that they are able to teach pitching mechanics that will avoid the catastrophic elbow ligament injuries that shut down careers. That’s because throwing a baseball overhand is an unnatural motion that will often lead to injury. Yet, there was a great Dodger pitcher, a Cy Young Award winner, that believes he knows the formula and absolute proper mechanics that will allow a pitcher to remain healthy and get the absolute most out of his arm for years. Mike Marshall was known as “Iron Mike” for one reason, and that was his ability to pitch day after day without fatigue or injury. In 1974 Walter Alston put him on the mound in 106 games as the Dodger closer. When we talk “closer” in that era, we aren’t talking about a ninth inning man. Marshall was called on as early as the fifth and sixth inning to close out some games. He pitched 208 innings out of the bullpen that year alone. He finished with a 15-12 record and 2.42 ERA. In today’s game where pitch counts have almost become the most monitored statistic in the game by managers, let’s put the remarkable achievement of Marshall in perspective. He was the “Kenley Jansen” of his day, the Dodger closer in an era when the number of saves wasn’t watched as it is today. The concept of pitch counts and lifting pitchers who had reached a certain numeric “fatigue” level was not even considered. Fact is, Marshall only had 21 saves that season, but it was arguably the greatest season ever for a closer in the history of the game. There was one occasion that season where Marshall pitched six innings of relief. On another he went five innings. Imagine throwing Jansen out there for a five or six inning stint. He’d have to sit out for the next 5 days. Marshall was back on the mound two days later after both incidents, and for more than an inning too, both effective outings. 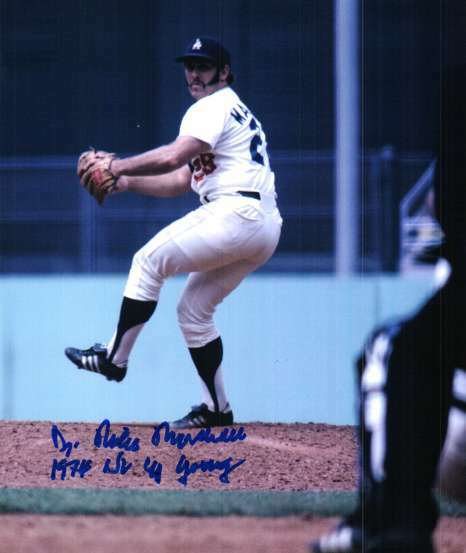 In that amazing 1974 season, Marshall pitched two innings 35 times. He went 2 innings plus 5 times, three innings 9 times, three innings plus 4 more times. He endured a four inning game another 6 times. Then you can add in the 5 inning game and 6 inning game. Of his 106 appearances, he went two innings or more 61 times, (a rate of 57.5% of the time). It’s simply an amazing feat. How could his arm be abused at such an astounding pace? Add to that his “out” pitch was a screwball that few throw today due to its propensity to cause arm injuries. What it comes down to is that Marshall understood the science of pitching and how to take advantage of that knowledge to get the most out of his body and comeback, day after day. Marshall admits today that he actually could have pitched even more that season. As a young man he was fascinated by science and I personally witnessed his reverence and respect for that. One of my earliest recollections of interaction with a ballplayer was when I watched him tell an autograph seeker once that he should get his science or math teacher’s autograph instead of an insignificant ballplayer like him. At the time we thought he was a jerk for saying it. Now that I look back at it, what he said made perfect sense. Kinesiology was Marshall’s field and he eventually earned a Ph.D. in exercise physiology. His Doctoral Dissertation was titled “A Comparison of an Estimate of Skeletal Age with Chronological Age When Classifying Adolescent Males for Motor Proficiency Norms.” All this was completed during off season study, (dissertation presented at Michigan State University, Spring, 1978). Marshall has answered questions from parents of young adolescent ball players over the years on-line. His position is clear with them and that is that their kids shouldn’t be throwing baseballs overhand until their bodies have fully developed and matured. His dissertation study specifically was related to that. Throughout his playing days Marshall was viewed by some as an eccentric player with wild ideas. The reality of the situation was that he was probably the smartest man in the game, and he had difficulty following the regimens of pitching coaches that he knew were ruining pitcher’s arms. His greatest successes occurred under managers and coaches that allowed him to do his own unconventional things, like throw weighted balls and exercise his arm through strengthening exercises when others said he needed to rest it. Marshall understood the human body and physics better than any player ever to play the game, therefore, a pitching coach couldn’t tell him to do something that was counter to science without resistance from Marshall. Gene Mauch in Montreal and Walter Alston in Los Angeles understood fully that Marshall could teach them each a thing or two and they were savvy enough to know that. Marshall’s greatest successes on the mound were under those two managers. 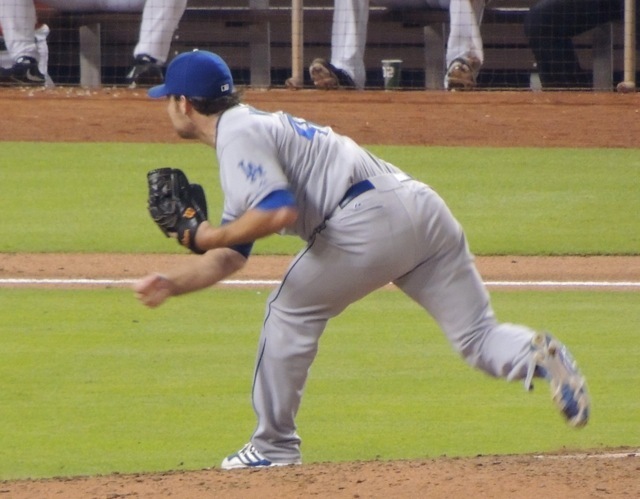 Now I could go into Marshall’s pitching school and the unorthodox pitching delivery that he teaches and the strengthening exercises that his pupils use, but that’s another article altogether. Marshall insists through empirical evidence that traditional pitching coaches teach methods that lead to torn elbow ligaments and other injuries. Marshall is a stubborn man. He’s not willing to enter back into baseball without fully integrating his entire pitching philosophy to an organization. That would include classroom study in anatomy and teaching methods that are unconventional. He was able to put these into practice at three different schools on the Junior College level to some success. Any attempt to hire him to work for an organized major league baseball team will fail because there's no doubt that Marshall will insist that the organization buys completely in to his methods. That’s not going to happen to veteran pitchers who have had success for years. Can you imagine a pitcher such as Verlander changing his entire pitching motion and starting from scratch after all he has accomplished in the game so far? What I wanted to address here really before going off on the Marshall rant, are the fallacies that the baseball establishment believes will conserve a pitcher from injury. Efforts by organizations to cut pitch counts and innings, or even shutting down pitchers as the Nationals did with Strasburgh are simply wrong according to Dr. Marshall. 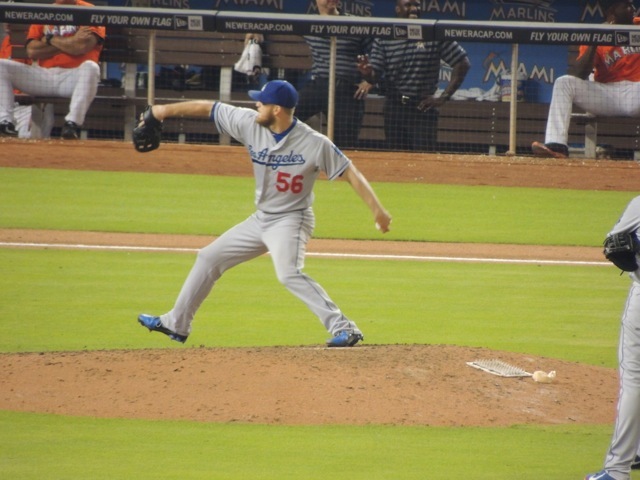 “Baseball pitchers tear the connective tissue fibers of the ulnar collateral ligament from mis-use,” he says. He stresses that if a proper motion is taught, that ligament can be saved from injury, but as long as coaches continue the methods that they use today in traditional coaching methods, those injuries are practically inevitable. Simply cutting back pitch counts and shutting guys down is buying a little time, but not stopping the ligaments from breaking down and reinjuring if the same motions are being utilized. Mark Walter, the Dodgers Chairman is quoted as saying that “pitchers break.” Based on the conventional pitching methods taught today and unnatural overhand motion pitchers use, he’s dead-on right. With recent talk that the Dodgers have addressed extending Clayton Kershaw for upwards of $200 million, it’s a scary proposition to think that he could go the route of Matt Harvey or Chad Billingsley on any given pitch, but it’s probably a chance they’ll want to take. 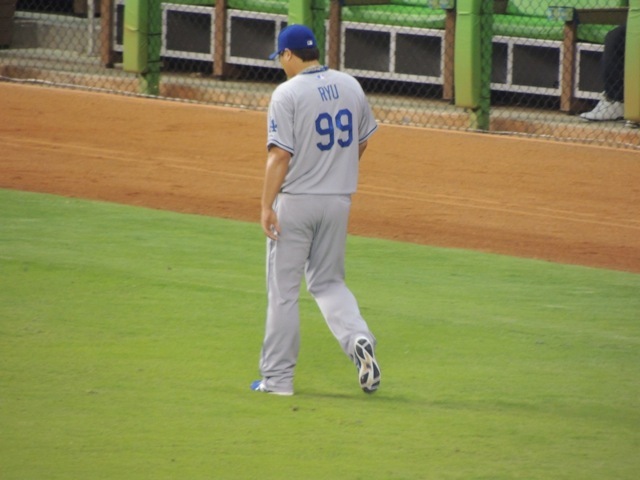 After all, if they don’t’ extend his contract at some astronomical figure, there’s no doubt he’ll sign with someone else and how will Dodger fans feel watching him pitch in the fall classic for Boston, St. Louis, Texas or the New York Yankees? Mike Marshall said it best in an email sent to a writer that referenced his work, in an effort to clear the record: “Unfortunately, unlike tendons, ligaments do not have pain sensors. Therefore, baseball pitchers have no idea they are tearing the Ulnar Collateral Ligament.” (Source to linked article) When the ligament goes, it goes without warning. So we simply have no idea. Kershaw could pitch ten more years without injury or (heaven forbid), go down in his next start, just as Matt Harvey did a few days back in New York. The clock is ticking. Long term contracts with pitchers have burned this organization before, but how could they possibly let the best pitcher of this generation walk away out of fear that his arm might go at any time? This is a risk that they’ll have to take. It might be the costliest risk this current Dodger ownership will ever make. I’m not going to mention his name. In fact, I won’t even address the topic (with the exception of this paragraph) because I simply don’t know exactly what happened at Dodger Stadium today between the Dodger manager and his right fielder. I could speculate, like many others will do, but who knows the reasons for the benching and exactly what happened in the clubhouse behind closed doors. The growing pains of this potential superstar continue to develop and one day, I believe we’ll all be informed about what happened. What we do know is that he’ll be in the lineup again on Friday and that the Dodgers won. For now, it’s accurate to say that the Dodgers have a four-some of starters that are as formidable as any in the major leagues. Ricky Nolasco has been more than anything ever imagined as a Dodger. 6-1 overall and 5-0 in August with a 1.64 ERA. 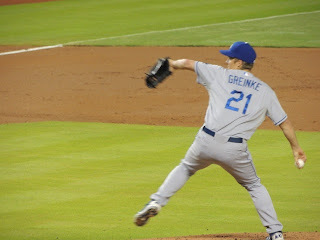 If it wasn’t for Zack Greinke and Clayton Kershaw, he’d be a candidate for pitcher of the month honors. This afternoon it was announced that the Dodgers have signed Edinson Volquez, recently released by the Padres. I’ll give this to Ned Colletti, he’s attempting to fill the weak spots on the roster and one that has recently been identified is the number 5 starter spot. Volquez is sporting an ERA over 6 and in a pitchers park like Petco, and that ain’t good, but if Rick Honeycutt is able to spot a flaw in his delivery or assist him in turning things around, (as they did with Marmol), how can this hurt? It wasn’t a few years ago that Volquez was seen as a potential number one starter with a bright future ahead. Guys like Josh Hamilton and Latos were traded for him. So his right arm was seen as valuable even if that was as long as five years ago. The Padres are paying his salary. How can this hurt? It’s almost September and if Volquez can provide better innings in the number 5 spot than Capuano, that’ll be icing on the cake. If he can’t, there isn’t much damage done. The magic number is now a Clayton Kershawesque 22, possibly to reduce to 21 if San Diego can hold their 5-1 lead over Arizona that is currently in the 8th inning. Padre outfielder Will Venable is really tearing things up for San Diego. That's a player to watch out for in this next series as the Padres head into Dodger Stadium for three. 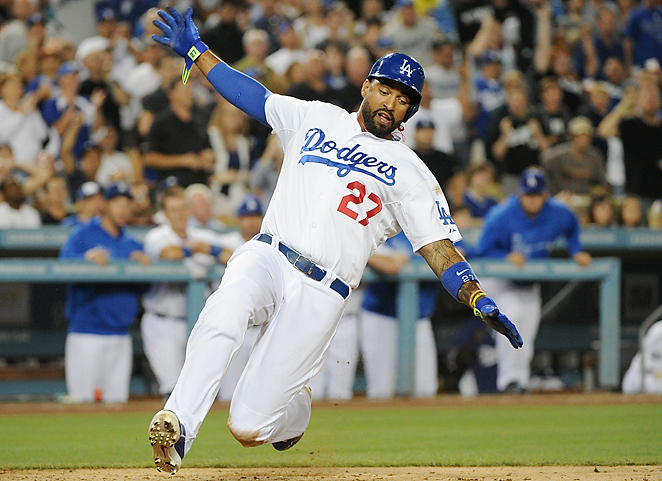 It’s August 27th and Matt Kemp has been out of the Dodger lineup now for a month and six days. 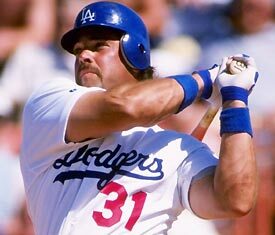 Reports are that Kemp ran the bases today under the watchful eyes of Davey Lopes, Don Mattingly and Stan Conte. He was tested with turns, stops and starts and base path cutting. Kemp seems to have emerged from the drills in good health. It is reported that he’ll repeat the process tomorrow if he has rebounded and is in good shape tomorrow. Up next will be a minor league assignment and attempts to get back up to game speed. 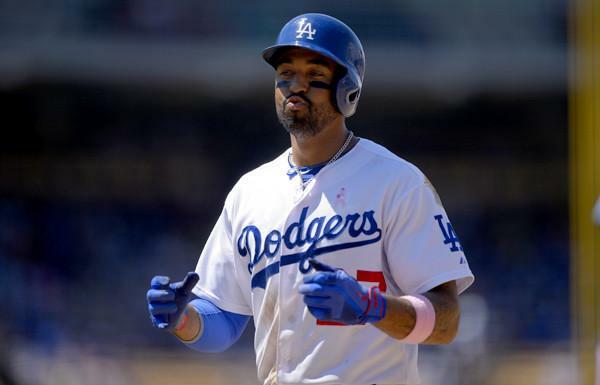 It’s probably unlikely that Kemp will be activated before the end of the home stand on Sunday when they finish a three game set against the Padres. The road trip coming up has the Dodgers traveling to Colorado for three and then on to Cincinnati for another three games. Barring a setback, I'd say Kemp will be seeing action in Denver and Cincy. Incredible. How do these guys keep their jobs? 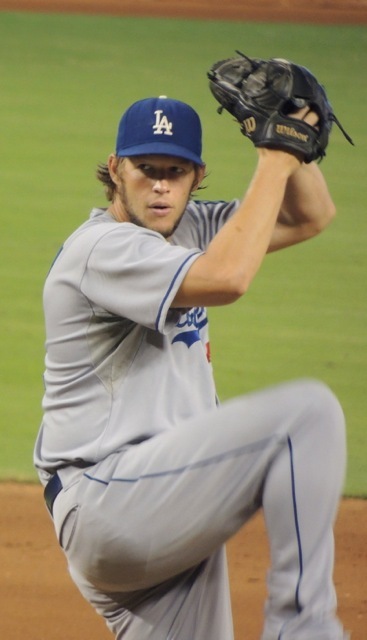 It isn’t like Kershaw is an unknown commodity in the majors. For the record, Kershaw is third in the league in the amount of pick offs this year with 5. Last year he led the league with 11. In 2010 and 2011 he had the second most amount of pickoffs. He had the third most pick offs in 2009. Translation: Kershaw has probably the best pick off move int he National League and he has for five years. Deshaies didn’t know it. The Dodger offense continues to struggle against mediocre pitching. Travis Wood is a fine talent, but he isn’t considered a number one starter of high quality, such as Kershaw, who wasn’t on his game tonight. 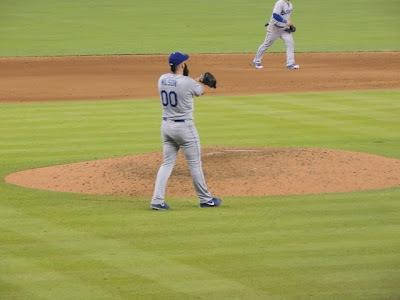 The Cubs hitting approach was excellent as they got Kershaw’s pitch count over 100 by the 6th inning, forcing the Dodger starter to depart the game after 5 2/3 innings. It was his shortest outing since April 23rd, a no decision at the Mets. The Dodger hitting has been on hiatus since they raked in Miami last Thursday. The hot offense cooling off was to be expected at some point, but it’s a concern how hitting approaches seemed to lack the patience of previous series. 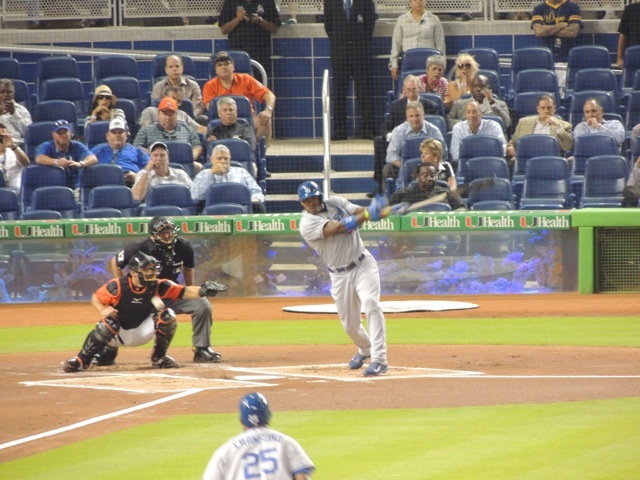 Hitters such as Uribe, Mark Ellis and A.J. Ellis are seeing their averages drop quite rapidly. The two out hits are not happening as they were during the midst of the Dodgers hot streak, but runners aren’t being left in scoring position at a rate similar to the first half of the season, so there is that. 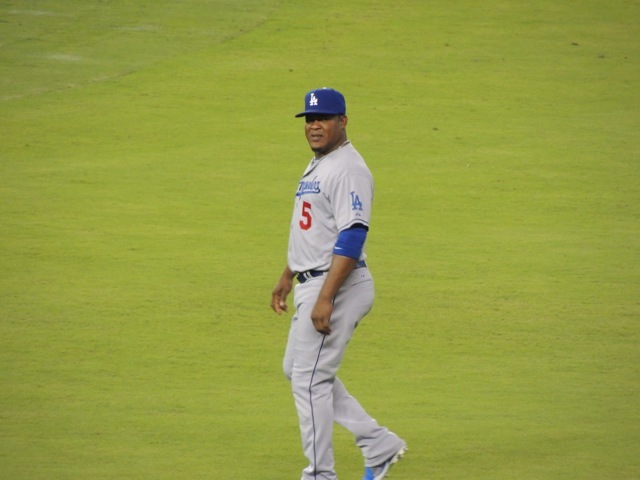 Juan Uribe’s two strike two out RBI single in the 6th inning was a welcome sight and broke Juan’s 0-13 skid. 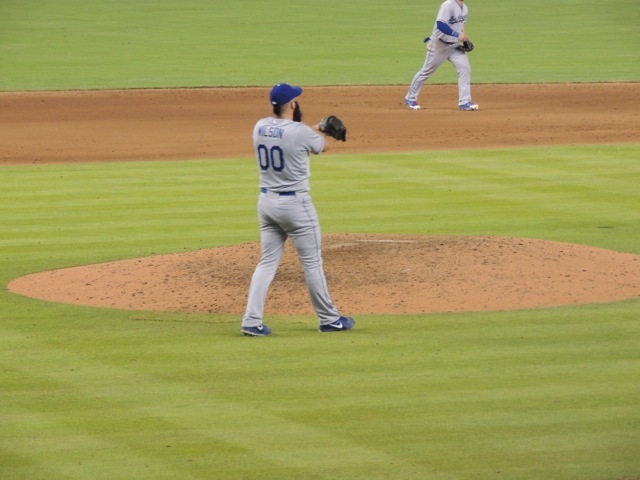 Ethier’s eight inning single to drive in the second run was clutch. Schumakers pinch hit double play groundout was crushing as the Dodgers appeared to have momentum going to get them in control of the game. What’s with Dioner Navarro and his dominance of the Dodgers? The guy is certainly motivated to beat them, the team that unceremoniously dumped him in the latter part of the 2011 season. Navarro had a reputation of not working hard and Mattingly let the world know that when he was DFA’d. Sometimes it is simply best to remain silent about things. A guy like Navarro will have an axe to grind against the Dodgers for the rest of his career. During that span he has lowered his ERA from 6.53 to 4.99. That’s not easy for a reliever to do. Once your ERA gets high, it takes a lot of stellar outings to make it respectable. Marmol is starting to do that. For the first time since MLB instituted Inter-League play in 1997, it may prove to be a disservice to the Dodgers. That’s probably because for the first time sine ’97, the Dodgers have a legitimate shot at going to the World Series. If that occurs and the Dodgers do make it to the fall classic, the Boston Red Sox have had their first taste of what the Dodger closer is like, giving them the opportunity to make some adjustments. 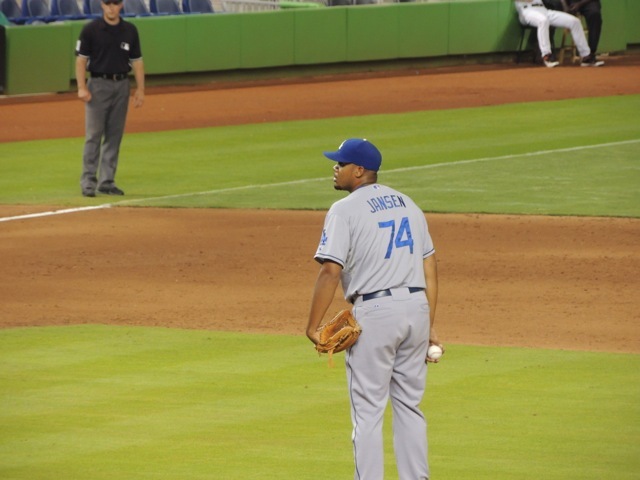 Red Sox commentator Dennis Eckersley clearly was unfamiliar with Jansen’s arsenal of pitches. He repeatedly mention that he expected an explosive fastball in the upper 90s range that would match Jansen’s frame. 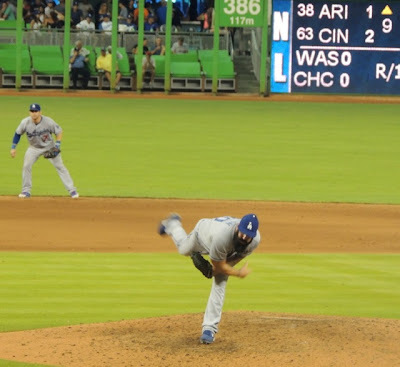 Eck had no idea that the Dodger closer had that deceptive cutter and he made it known that the fastball he displayed was not impressive, but the late movement on the cutter was. With one more game to go, it’ll be interesting to see if the Red Sox make some adjustments in the event that Jansen is called upon again. On the other hand, the Dodgers didn’t march out Kershaw and Greinke for this BoSox series, which forces them to focus on scouting reports if they face them again in October. What few will dispute this year regarding inter-league play is that the Dodgers have had their best result at it in their team history. With a 12-7 record going into their final contest today, the Dodgers beat up on the A.L. East this time around, a division that many consider to be the best in baseball. Sweeps of Toronto and Tampa Bay were quite impressive. If the Dodgers pull off the win today, they will have gone 15-0-2 in their last seventeen series. 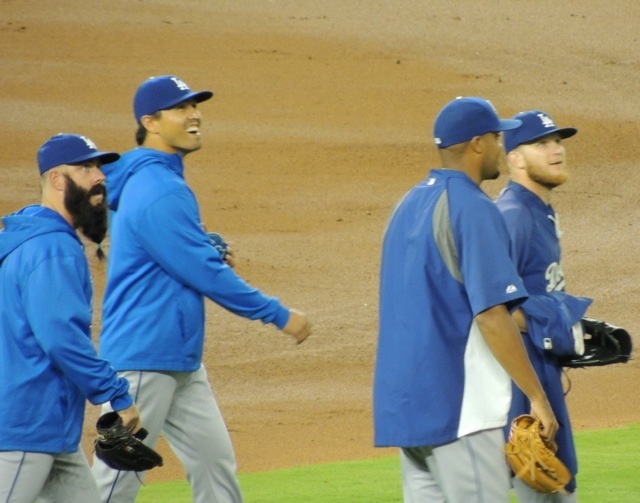 There is some concern in blogging sectors that the Dodger offense is disappearing again. A two game drought against two quality Boston pitchers may be the primary cause, but this amazing run can’t be expected to last forever. Perhaps a little bit of a slump will be welcomed in the long run. Peaking in August is not what the Dodgers want and as Arizona keeps losing and the magic number is now dwindled down to 24 prior to tonight’s action, the Dodgers probably have the luxury of time to heal up and be prepared for post season play at close to full strength. With thirty-three games left and a whole bunch of them after the rosters expand, it may be time to allow some of the banged up vets some decent rest. If by August 31 the Dodgers maintain close to a double digit game lead with the Arizona elimination number reduced to 18 or 19, It'll be time for management to begin a complicated juggling act of sitting guys, and assuring that they maintain game ready for when the true games begin in early October. 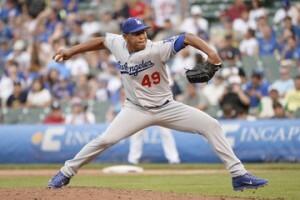 Tony Jackson’s blog, “Dodgerscribe.com” has been up and running for a couple of weeks now. I’m not intending to offend any other bloggers out there, but It is safe to say that he provides the most comprehensive coverage on the team, both home and road. When his site becomes a pay per view website during Spring Training in 2014, it’ll be money well spent. The man simply provides cutting edge Dodger news. He has updates throughout the day Fact is, there probably isn’t a need to read anybody else when it comes to the latest news on the team. He’s on sight and reporting immediately. We’re real lucky to have this guy and I’m becoming so addicted to his updates, that I wonder how I survived without them before. 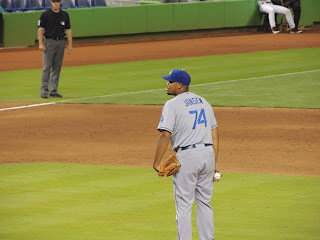 So if you haven’t checked him out yet, drop everything you’re doing and peruse dodgerscribe.com right now. You will not regret it. LOS ANGELES – Hall of Fame broadcaster Vin Scully, an icon in American sports history, will return to the Dodger broadcast booth for an unprecedented 65th season in 2014, it was announced. Scully will again call all Dodger home games and road games in California and Arizona. Widely regarded as the finest sportscaster of all time, Scully’s 64 years of service mark the longest tenure in his field. He will call all nine innings of the team's television broadcasts on Time Warner SportsNet LA beginning in 2014, with the first three innings of each of his games also simulcast on AM 570 Fox Sports LA. Scully began his professional baseball broadcasting career in 1950 with the Brooklyn Dodgers. He was inducted into the National Baseball Hall of Fame in 1982. During his unmatched career, he has called three perfect games, 25 no-hitters, 25 World Series and 12 All-Star Games. Iconic moments called by Scully include Kirk Gibson’s miraculous Game 1 homer in the 1988 World Series, Don Larsen’s perfect game in the 1956 World Series, Hank Aaron’s record-setting 715th home run, Sandy Koufax’s four no-hitters, including a perfect game, and the scoreless-inning streaks of Dodger greats Don Drysdale and Orel Hershiser. 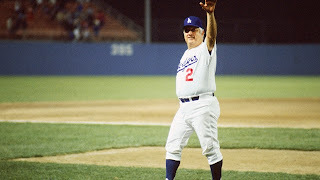 In Los Angeles, Scully has called Dodgers World Championships in 1959, ’63, ’65, ’81 and ’88 and he was elected the top sportscaster of the 20th century by the non-profit American Sportscasters Association. Yesterday was my last day in Miami and witnessing the Kershaw masterpiece and a Dodger offensive explosion was a good way to get out of town. The Dodger debut of Brian Wilson was icing on the cake to close off the four game set. Unable to complete this piece on Wilson before departing, I figured I could finish it on the plane back, only to find out that my laptop was completely out of battery power, Such is life of a frustrated blogger that attempts to get a post up everyday. Sometimes, it’s just not in the cards. The guy was seen as aloof and obnoxious. He played for the heated rival and we couldn’t stand his antics. If you dug down deep and admitted the honest truth, he was pretty darned good, and that’s probably why we couldn’t stand the guy. He’d finish a game and do a gesture that we thought was arrogant and showboating in nature. So did some Dodgers apparently as third baseman Casey Blake mocked it after homering off of him in a tight game. He was livid about that and later it was determined that the gesture, (crossing his arms and pointing to the sky), was a tribute to his dead father, his faith in God and fighting for his teammates, Blake apologized. Then there was the beard. First it was short and trim and it gave him an intimidation factor that just added to his aura as one of the most successful closers in the game. Then it got long and started looking different. He dyed the thing jet black, then he added a mohawk to it, and people started questioning his psyche. Probably a few hitters started wondering too. It worked. He was dominating with a league leading 48 saves and 1.81 ERA in 2010. 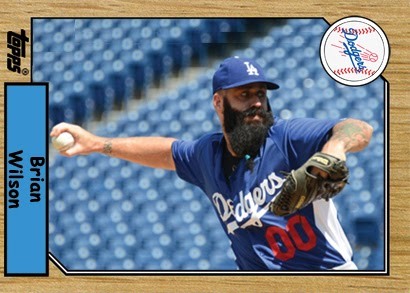 Rip Van WInkle was on the mound with a 98 MPH fastball. Or was it the bass player from ZZ Top? None of us were quite sure, but it was a strange sight and since he was a Giant, we could laugh at the look. At least until he stepped on the mound. 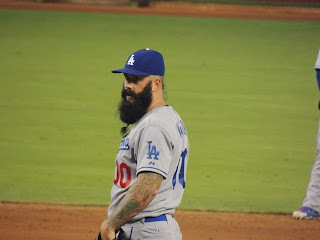 “Fear the beard” became an advertising slogan of the Giants and in 2010, the ‘beard’ made it to the final game of the World series, recording the final out of his teams first World Series championship in 56 years. When he blew out his elbow in the first month of the 2012 season, it appeared his career might be over. This was the second Tommy John surgery of his career. He rehabbed hard and remained the ultimate teammate, sitting in the dugout for the entire year and remaining with his club all the way to their second championship in two years. With a contract that expired at the send of the season, his arm in tatters and a full rehabilitation process in the works, the Giants cut bait and let him loose. There were some bitter feelings on his end. The timing of the injury couldn’t be worse for him. It was the only organization he had known, and they took a chance on him and drafted him in the 24th round of the 2003 amateur draft, when he was coming off his first ligament replacement surgery. They gave him a shot once, when he was a lowly minor leaguer, but now as a major league all star who was earning $8.5 million per year, the organization felt that investing in him after the second surgery would be too risky. So he worked hard. He even set up an audition in February for some major league teams in Los Angeles. Apparently it didn’t go well. He was still months away from being ready. Nobody took a flyer on him. The months passed and he kept working out. Every once in a while a rumor would surface that he was ready for a comeback. There were the Oakland A's, the St. Louis Cardinals, the Pittsburgh Pirates. Rumors swirled that all were interested in him. The one organization that we didn't seem to hear about was the L.A. Dodgers. The interesting thing about the situation was that he wanted to pitch in Los Angeles. His home is in L.A. So is his entire training routine. In late July there was an interview on San Francisco radio with Ryan Vogelsong who admitted that he and the Giants pitching coach Dave Righetti had met Brian Wilson at a local community college for a private workout. The Giants were apparently interested and it looked like a deal would be reached. There was one problem though, the Giants had fallen out of contention and suddenly, they weren't a consideration anymore. So on the eve of the trade deadline date, Wilson signed with the Dodgers. He wanted to pitch on a contender. He wanted to pitch near his home. Ned Colletti, who signed him originally while with the Giants, once again was willing to take a chance on Wilson following a Tommy John surgery. Most of all, Wilson wants to revitalize his career. These two months could be an audition for a big money contract next year. His role will be as a set up man. Essentially to get the ball to Kenley Jansen for the 9th inning. Twenty three days later, he entered his first major league game and the results were good. Four batters faced. One hit allowed, two strikeouts, zero runs scored. He hit 94 MPH on the stadium radar gun. He punched out superstar hitter Giancarlo Stanton, his first hitter. It was a 6-0 blowout, so the pressure wasn't there, and Wilson admitted that he wasn't even nervous. Nevertheless, he had to be pleased with the results saying, "It was an arduous process. But I'm glad I went through it so I can appreciate baseball once even more." It's going to be an interesting two months. Today was a numbers day. It was the Dodgers 74th win. Closed out by NUMBER 74 himself. and then when Cincinnati beat the Diamondbacks a few minutes later, to Tim Wallach. for his final seven innings of work. Okay, that was kind of dumb, so I won't prolong it. There were more interesting photographs that I took at today's game. 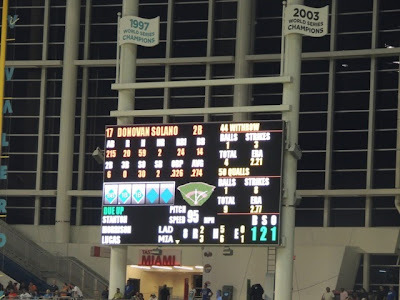 Aside from all the Dodger wins, there's something about these Marlins games I'm liking. With Greinke's 12th win on the season, the Dodgers now have their top three starters at 12 wins a piece, making it realistic that they can each finish with 17 or 18 wins. 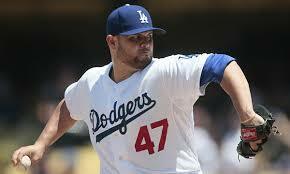 Throw in a very effective Ricky Nolasco and the Dodgers starting four has the potential to go far in post season. I know it's early, but is there really a need to place Chris Capuano on the playoff roster? That will be a debate for another day, but I find it hard to legitimize his addition to the 25 man squad in post season play. The Dodger lead in the division extended to 8.5 games with 36 to play. As much as Diamondbacks fans would love to be in the running during the September N.L. West stretch drive, it's looking more and more that the final series' against division foes will be anti-climactic. Arizona will soon be aiming for the wildcard slot, which is going to be tough to come by because after tomorrow they will have no head to head match ups with Cincinnati, St. Louis or Pittsburgh remaining. Interestingly, they may have to become Dodger fans in September when the Dodgers travel to Cincinnati on September 6th, 7th and 8th. If the Dodgers find themselves with a double digit lead by then, it'll be in the D-Backs best interest for the Dodgers to sweep the Reds and increase Arizona's chances against the Reds for the final WC spot. As much as many will say it is taboo to talk post season play already, the Dodgers remaining schedule looks very favorable towards an early clinching. Following the Dodgers series at home with Boston this weekend, the only teams over .500 that they will face in the final 32 games will be the D-Backs for six and Cincinnati for three. It’s not like you always hear things like that out of the blue, but such is life when you wear the Dodger gear while on the road. Those words came from this guy wearing a Yankees shirt who struck up a conversation with me at a Pompano Beach, Florida Mall yesterday, as I walked around shopping with my wife. My Dodger hat apparently attracted some attention. 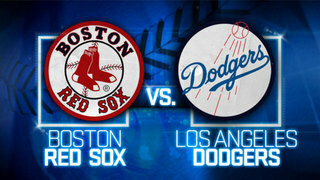 Now, usually I just blow off the negative comments about the Dodgers. After all, living in Giants country it is quite normal to hear them all the time, but this was different, I was in neutral territory. On top of that, his opinion was ridiculous. 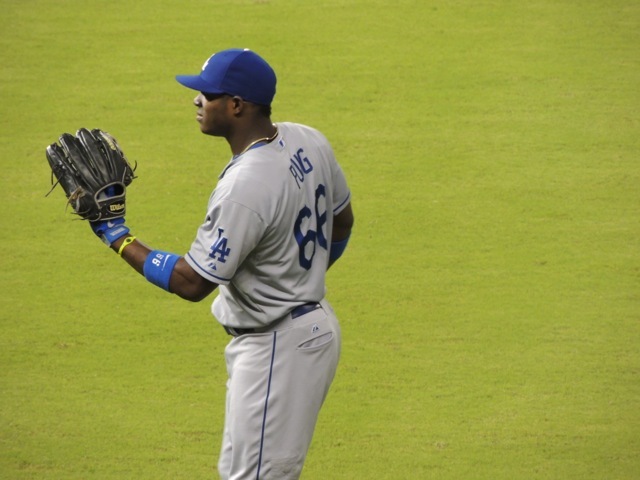 Puig is the most toolsy player to come out of the Dodger system since Roberto Clemente. “Have you seen him play? Have you seen his tools?” I said. “Yeah, I watched him get dominated last night against that Cuban pitcher the Marlins have,” he replied. “Well, I saw him strike out four times in San Francisco a month and a half ago, and despite that one game he’s still the most amazing player to come on the baseball scene in decades,” I replied. “Just keep watching my friend, he’s a potential Hall of Famer.” That’s all it took for two baseball fans who didn’t know each other to engage in a heated baseball conversation for 15 minutes. All the while my wife rolled her eyes and eventually walked away and continued shopping. We talked about just about everything baseball and a lot of stuff Dodger related. A lot about Mattingly, who he revered. The fact that the Dodgers are real, their amazing run and how they should be favored to win the World Series. It was a detailed talk on baseball with a complete stranger who said he knew his baseball, but admittedly hadn’t seen much of the Dodgers. “Just watch Puig, because your tune will change on him. 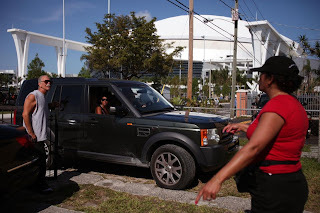 He was pressing on Monday night because it was his first appearance in Miami, he had friends and family here, plus a lot of attention from the Cuban community. You saw the big crowd reaction to him, he’ll be okay. He makes some mistakes and he’s learning the nuances of the game at the biggest stage, but you don’t hit .350 over 300 plate appearances without having some ability. He’s got Clemente’s arm, Bo Jackson’s speed, and a flair for the dramatic like a Reggie Jackson.” I said. We did see. About five hours later we saw. 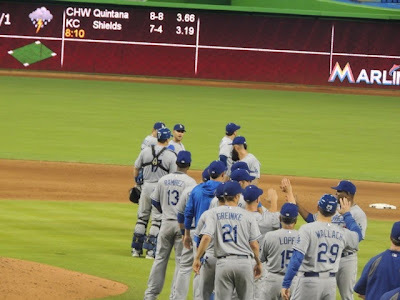 The Dodgers lost their second consecutive game for the first time since June 22nd with a 6-2 loss at Marlins Park in Miami tonight. Of course, I had to be in attendance for this one. It’s not like I'm trying to set a trend this season, but I have accomplished something that few people on earth have in the past two months, having attended two Dodger road games, both of them losses. When you consider that the Dodger road record during that time frame is 19-4 (from July 6th through tonight), that’s quite a feat, making me wonder if I should stay away for the rest of this series while I continue to vacation in Miami this week. This was a battle of rookie pitching stars tonight, and neither one of them disappointed. Cuban rookie phenomenon Jose Fernandez came to the ball park with a lot to prove. 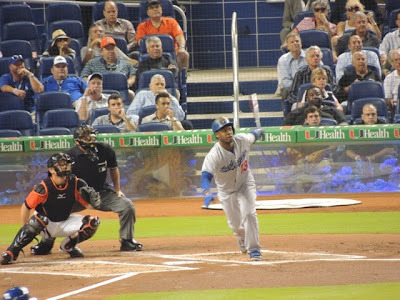 With all the Yasiel Puig hype, Fernandez showed a crowd of 27,127 that there is a Cuban pelotero with the local club that should be hyped as well. 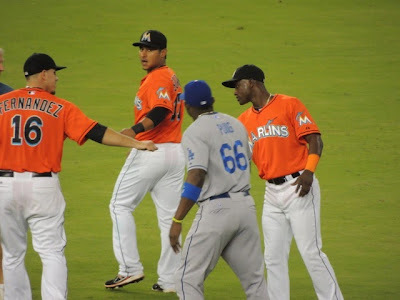 Yasiel Puig and Jose Fernandez had just embraced in pre-game warmups. I just missed getting it on film. Here they say their goodbyes about 5 minutes before game time. A rare occurrence with a starting pitcher on his day. Hitting 97 MPH regularly on the radar gun, Fernandez struck out 8 Dodgers (including Puig twice) over six innings of play. He worked himself out of jams and was effective throughout the night mixing an assortment of off speed and breaking stuff to keep nearly everyone on the Dodgers completely off balance. 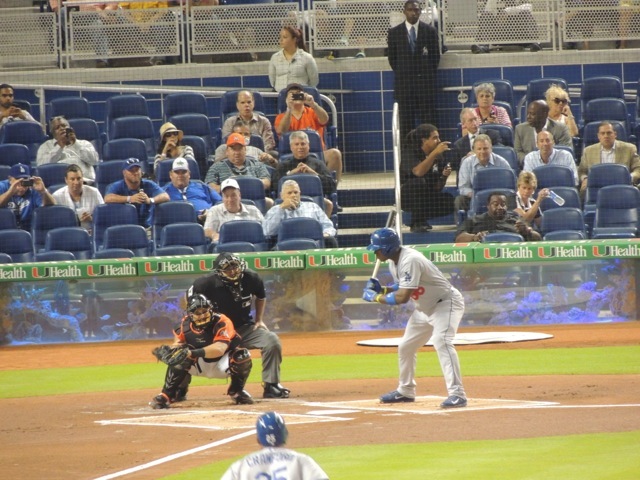 Yasiel Puig strikes out in his Miami debut in the Major Leagues. That one exception was JuanUribe who went 3 for 4 and he wrapped a key RBI double in the top of the sixth to tie up the game and give his club a fighting chance for a comeback win. 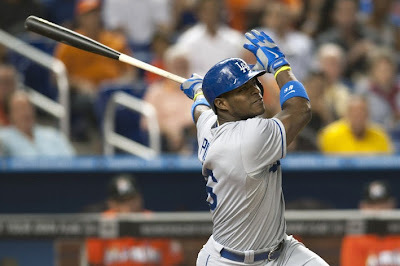 But the Marlins came back in the bottom of the frame for good, scoring a go ahead run on a Logan Morrison double down into the right field corner that was roped to Yasiel Puig’s left. 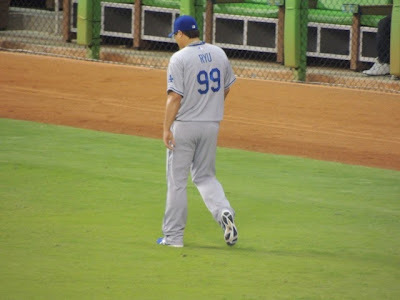 Hyun-Jin Ryu worked into the 8th inning, but after retiring the first out of the inning, his pitch count reached 114. 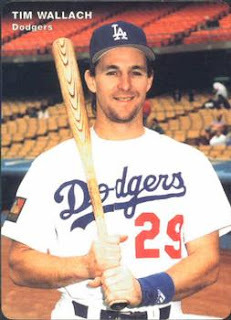 Mattingly pulled him in favor of Chris Withrow who struck out Donovan Solano. Giancarlo Stanton followed and he blasted a deep homer into the centerfield art deco display to give the Marlins a 4-2 lead. 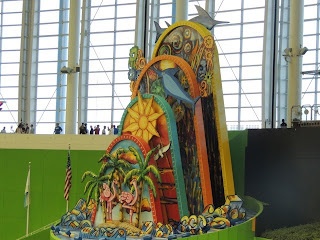 The Marlins then got a series of hits off of JP Howell and tallied another 2 runs to put the game out of reach. 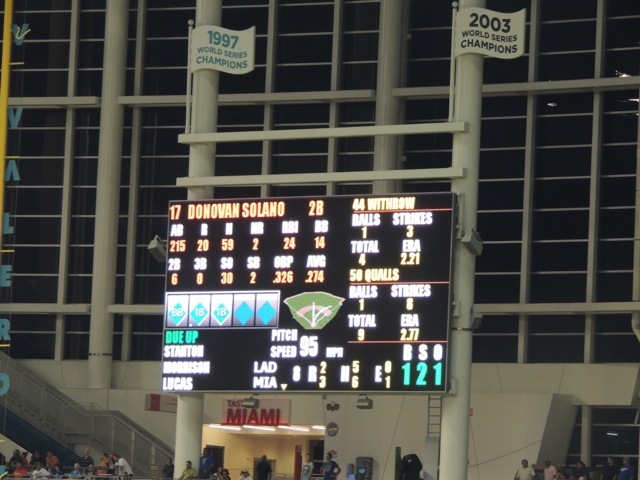 Marlins Park becomes the 12th road ballpark where I have seen the Dodgers play. Those Parks are: Shea Stadium, Fenway Park, Oakland Alameda Coliseum, San Diego Jack Murphy Stadium, San Diego Petco Park, Colorado’s Coors Field, Arizona’s Chase Field, San Francisco’s Candlestick Park and AT&T Park, Anaheim Stadium, Houston’s Minute Maid Park, and tonight’s game at Marlins Park. It's hard to believe that I was in Lake Tahoe in this softball tourney a mere 24 hours ago. We didn't do too well, but it was fun as always. This is a team of guys from work, Note our good friend, Figgy in the front row with the Dodger cap. He contributes to comments on this blog quite often. He was really talking smack to the Giant fan opponents in this tournament. 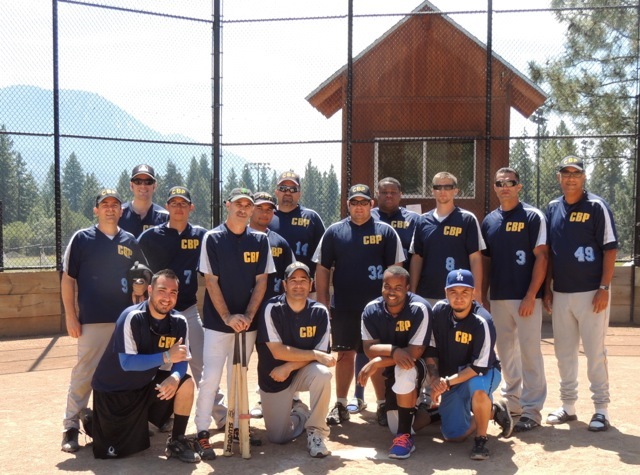 It has been a whirlwind 24 hours of travel for me as I was in Lake Tahoe yesterday, finishing up an 8-game softball tournament at 6,400 feet in elevation. Once the games ended, I drove the 250 miles home in horrid weekend traffic (it took 7 hours to get home), and then I caught the red-eye for Miami, where we arrived in sweltering humidity this morning at 7:30 am. 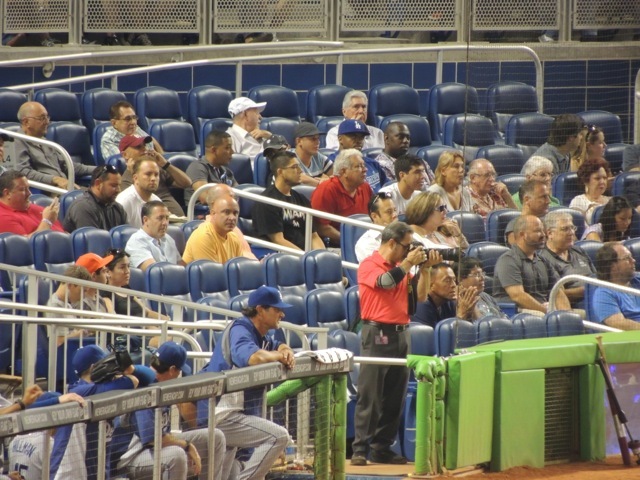 I did a bit of research before coming to the game tonight, as I figured it would be in my best interest to purchase tickets at the last minute, as there aren’t a lot of Marlin sell outs throughout the year. My wife tagged along with me as we departed from our hotel in 83 degree heat that felt more like 110 due 79% humidity in the region. Now don’t get me wrong. My wife is a sweetheart and all and a good sport when it comes to my Dodgers fanaticsim, but she isn’t a real bundle of joy when it comes to being in unbearable humidity and an unfamiliar setting. I attend my Dodger games early. It’s the way I always roll. I like to take in the atmosphere at the ball park. Watch some B.P., and witness the players interacting with the fans. My wife? Well, she likes to arrive about the time first pitch rolls out and then depart early if at all possible. I could talk about how she wanted to leave in a tense September 2004 game with the Giants, but you get my drift. She’s accepts me and my faults, and for the most part, she’s able to sit through most of my baseball passion with patience. Today wasn’t going to happen the way I figured. When we arrived near the ball park, I found my assigned parking spot. I reserved it on line. 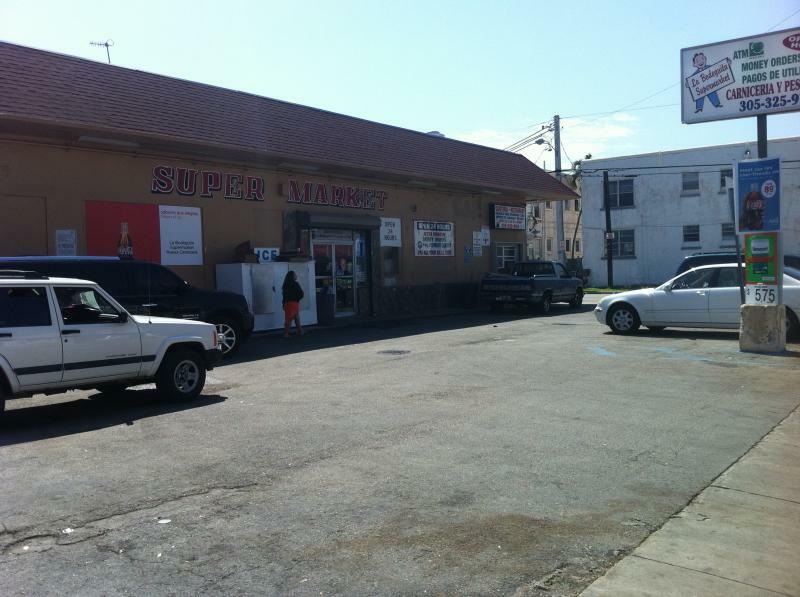 The residents in the area allow you to park in their front yards for a fee that is considerably less than the $20 charged by the Lorias to use their monstrosoity of a parking garage. 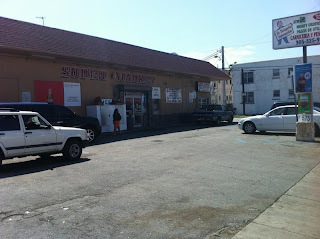 I paid $7 for my reserved spot, that wasn’t a front yard, but the parking lot of a Latin Market, “La Bodeguita” on 12th St.
La Selva Negra restaurant. A "must" visit location. The food is awesome. It's a shame that this photo was taken with the I-phone. 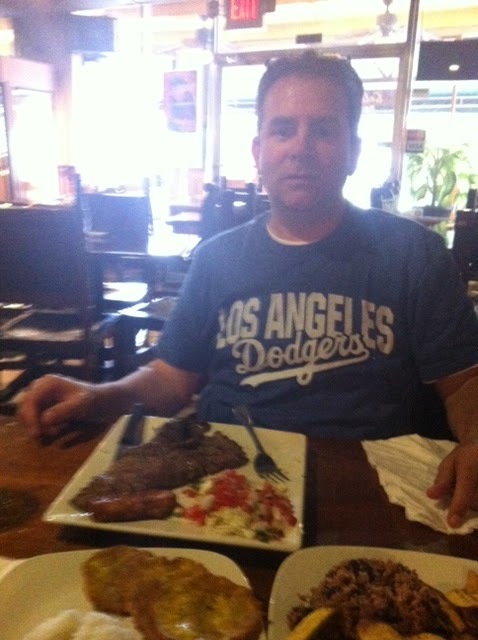 The food was delicious and the portions very plentiful. 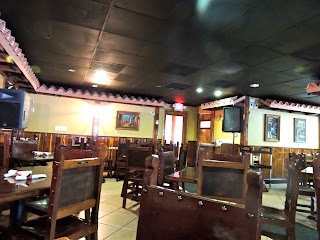 Since we were two hours early, My wife suggested that we go to “La Selva Negra” restaurant a few blocks away. She was familiar with it because about three months ago, visiting family in Miami, they took her there. It is Nicaraguan cuisine and absolutely delish. If you come to Miami to see the Dodgers, do yourself a favor and go to this place. For $10 I had a plate of carne asada, side salad, fired platanitos (tajadas verdes), gallo pinto (a rice/bean combo dish), a refreshing guava/orange mixed fruit drink and fried cheese. An awesome meal. Nicaraguan cuisine is a must for those unfamiliar with it. The only drawback was I had to eat fast in order to get to the game. We drove back to the reserved parking spot I had at “La Bodeguita.” I walked in the market and the owner said he’d take care of my car. I’m not sure how he’d do that since he had a store to attend to, but I guess he hasn’t had problems in the past. "La Bodeguita" parking lot. Where my vehicle was parked for the game. The neighborhood is, well, how can I say this? It’s interesting. I think it’s safe enough for me, because walking through there on a night when thousands aren’t going to a baseball game might be a little dangerous. 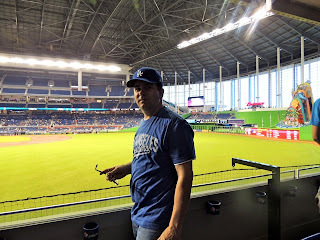 My three block trek from “La Bodeguita” to Marlins Park had us stepping around a few vagrants, over littered streets around some abandoned buildings and over broken glass. Front yard parking, gives the locals in Little Havana a bit of extra income. Some of the homes had converted their entire front yards into parking lots. A woman had a receipt book as she tagged cars entering into her front yard, charging $10 a piece. There were 14 cars already on her front lawn and she was telling a driver that she would watch the vehicle with an eagle eye while he was at the game. I read on a web site that some even offer the service of washing the cars for an extra fee. A scalper tried to sell us tickets right in plain view of a policeman, which leads me to believe that scalping is either legal, or it isn’t enforced. 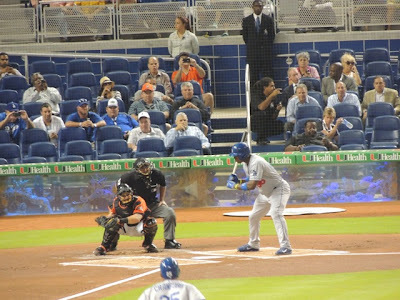 He had down the third base line by the Marlins dugout that he was selling for $10 under face value, but I wanted to sit in Puig territory out in right field, so I went to the box office and dropped $18 down for each ticket as I was got tickets in the second row in right field. My plan was to check out the whole ball park. Check out the night club in left field, the bobble head doll museum or display (whatever it is), and take photos from various spots in the park. But it simply will have to be for another day. We arrived just before first pitch and there was a game to concentrate on. My impressions of the ballpark. Nice. Good views throughout. Problems viewing the scoreboards, but that might have been because I was in the outfield and my distance eye sight is deteriorating with age. The green colors contrasted with ocean blue colors took some getting used to. 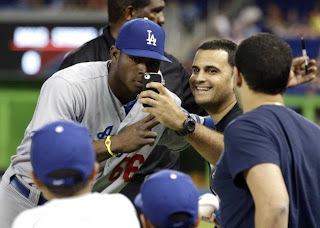 The place is pristine clean and the fans very courteous except for a few hecklers that were insulting Puig in Spanish. I’m looking forward to spending more time in the venue the next time around which will probably be on Wednesday. Kershaw Start Tonight - Will The Offense Show Up?